! This is NOT a method of direct communication with BREEZY BLOSSOMS FLORIST for purposes of ordering or rectifying problems. EXQUISITE,BREATHTAKING and In A CLASS of Its Own are words to describe the customized,banquet-style floral arrangements that were presented at my Memphis Retirement Party. Kaylee's exotic flowers and custom vases designs surpassed my expectations. Guests and service attendees were awestruck! To set the stage for an event like no other,Breezy Blossoms will far exceed your expectations! Kaylee, thanks for going over and beyond in making my special occasion one that I will never forget! 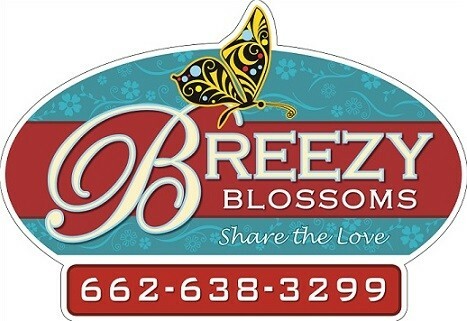 Breezy Blossoms is very responsive - and willing to go the extra mile when needed. I appreciate them very much! Breezy Blossoms is a great little florist. Her work is very professional and always ready when needed. She can do it all! I've never been disappointed with my daughter's flowers. Not only does she do a great job, she will deliver them to the cemetery and put them out. She is absolutely great! You will never go wrong with Breezy Blossoms! My family is so thankful for Breezy Blossoms. Thank you so much for the kind words! And it is an Honor that you trust me to do such a special job for you! Thank you so much for your support !! I was impressed with the professional, fast, high-quality service when I ordered flowers with Breezy Blossoms Florist. The bouquet was lovely. I would patronize them again and recommend them to friends. The best lil flower shop ever!! They know how to take care of any need you have with any budget. I personally guaranty that you will love what ever it is that you ordered. Its very obvious they take pride in their work. Also very obvious they love to help ppl on their special day! Hey everyone! I have worked very hard to create a beautiful place to visit both in person and online. Share the Love is our slogan and that is exactly what we to everyday! Look forward to seeing reviews fro my Happy Customers here. Thanks in advance.